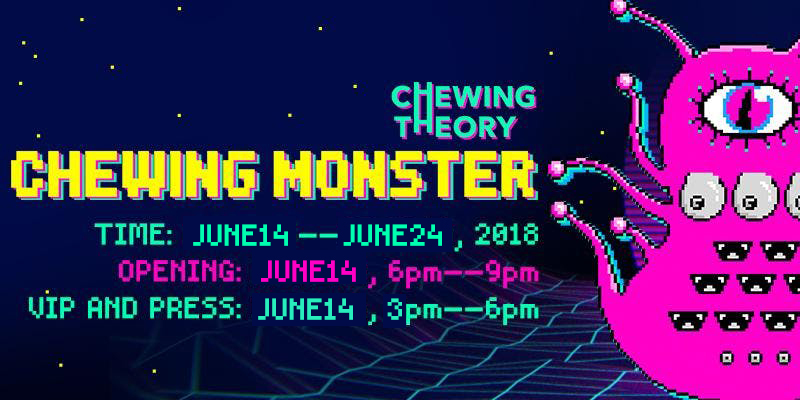 Chewing Monster is an immersive and participatory pop-up exhibition curated by a newly launched creative cultural brand, Chewing Theory. As the brand’s initial project, Chewing Monster explores intercultural, intergroup, and intermedia communication in the posthuman era from within the imagined context of an ‘organic monster farm.’ The exhibition brings together innovative ideas from the worlds of art, design, digital programming, gaming, and fine dining, showcasing to visitors an alluring world of intense visual, cerebral, and sensory pleasure. Opening Night Tickets: $25 (including appetizers and special gift package, only a limited number are available). Chewing Theory is a newly-launched creative brand by HE Wei, the co-founder of HE+HU Creative Collective and member of NEW INC. Consistent with the collective’s previous endeavor, the brand is dedicated to sensory experience, cultural communication, and human-machine interaction through interdisciplinary art programs, combining sculpture, installation, design, technology, performance, and food to create a participatory art event. We aim to explore the balance among space, art, and the digital (virtual) world that at the moment intersects closely with the physical one. Chewing Monster is the first organic and sustainable monster farm to land on planet Earth. This ambitious project is owned and operated by Chewing Theory, a forward-thinking company dedicated to upgrading the future of dining practices and other sensory experiences across all known and unknown universes. Guided by the twin principles of sustainable living and customer satisfaction, the farm answers the human world’s urgent call for clean edible alternatives by offering organic, cognition-enhancing monster products along with an entertaining farming experience. To ensure a smooth launch for our new enterprise, the farm’s advisory board has decided to open up to support and investment from the human community on Earth, pursuing co-development with humankind in the interest of the universal common good. Chewing Theory is a company incorporated in the Chewing Universe. Our mission is to expand the horizons of human dining practice and sensory experience within and beyond the dimensions we inhabit. Our foremost service is organic monster farming, a storied practice whose roots can be traced back to the prehistoric era. Today we have established an extensive network of businesses throughout the vast reaches of known and unknown universes. We are looking forward to a mutually-beneficial and prosperous future on planet Earth. The scale of challenges facing the food and drink industry on planet Earth is now immense. In recent years - whether in response to the global threat to food security posed by climate change, or the demand for greater transparency and accountability in the industry from increasingly conscientious consumers - painstaking effort has been invested into seeking alternatives to standard industry practice. A new breed of buzzwords has risen to the fore: ‘clean’ products help reduce carbon emissions; ‘biohacking’ snacks boast brain-boosting properties while remaining free of unwanted side-effects. Venture capitalists are pooling their money into food tech companies, thus making the industry considerably more lucrative. The potential profitability of these new initiatives is driving us to look beyond conventional edibles for humankind. When we remove the arbitrary limits imposed by Earth-based biology, what else can we envision? Monster sightings have been frequent throughout human history. (Of course, we believe many of these sightings can be explained as livestock samples and their offspring accidentally - or, to be more accurate, purposefully - unleashed onto earth from monster farms in our universe.) It was delightful to discover that the therapeutic functions of our prized creatures were registered in some of the most significant myths of ancient humankind. Take, for example, the famous ‘Huangniao’ or ‘Yellow Bird,’ the meat of which is said to relieve anxiety; or the fabled ‘Shirou,’ an edible monster resembling a two-eyed lump of meat which magically grows back as fast as it is eaten. Recently commissioned studies have found that our escaped monster samples have adapted to the digital domains of contemporary life by feeding on behavioral and emotional data in order to yield cognition-enhancing edible products. This evolutionary innovation has the potential to greatly reduce the wasteful consumption of bio-resources while dramatically improving energy efficiency. Therefore, we believe it is high time to fulfill this growing hunger of mankind, with the inauguration of a new Earth-specific venture geared toward revolutionizing the human dining table – a task to which we are uniquely suited as the first extra-galactic enterprise to land a monster farm on planet Earth. The first inhabitant of our farm is Chewy, whose ancestor, ‘Shi Rou’ migrated to earth in prehistory. In addition to the self-regenerative ability inherited from its ancient predecessor, Chewy has been bred for superior sustainable edibility, with meat and dairy developed to enhance human appetites and pique curiosity. Chewy’s self-regenerative ability will help to reduce costs in the start-up phase of our business. Guided by the twin principles of sustainable living and customer satisfaction, we are building a cost-effective system that combines farming with ecological tourism. The farm will have 3 functional areas: the shelter, the dining hall, and the store. Opening the door of the shelter to all customers, we encourage everyone to take part in our daily work routine. Our staff will give each visitor a warm welcome and provide instructions as they assist us in feeding, milking, and grooming the monsters in our specially designed bio-labs. The dining hall provides an authentic and entertaining farm-to-table experience with organic monstrous dishes served, natural and fresh. The store is where visitors can discover and shop a quirky and unique range of monster-related products and supplies. All who volunteer at the shelter will be rewarded with secret gifts (which may or may not be living things) in acknowledgment of their contribution. To better manage our enterprise, an exclusive advisory board of experts and professionals in the monster-raising industry has been assembled to determine the farm’s key strategies. In addition, we have managed to recruit some of the multiverse’s most talented and hardworking researchers, monster breeders, and apprentice farmers. Their duties include but are not limited to: monitoring Chewy’s vital signs, preparing feeds, cleaning and processing excreta, and ‘hacking’ the yields to produce optimal flavor. Only sustainable and organic farming methods will be utilized, with no reliance on chemical pesticides/fertilizers. Dedicated to our mission of expanding the horizons of human dining practice, we are including in our market segment every open-minded human individual who is curious about the unknown. As we have only recently moved into the human sector, there is no doubt that we need to devote significant time and energy to attracting potential human customers. Aside from opening our facilities for an immersive farming experience, we will also be employing social media to share our story, casting a little light on a world you know that you do not know that you know. 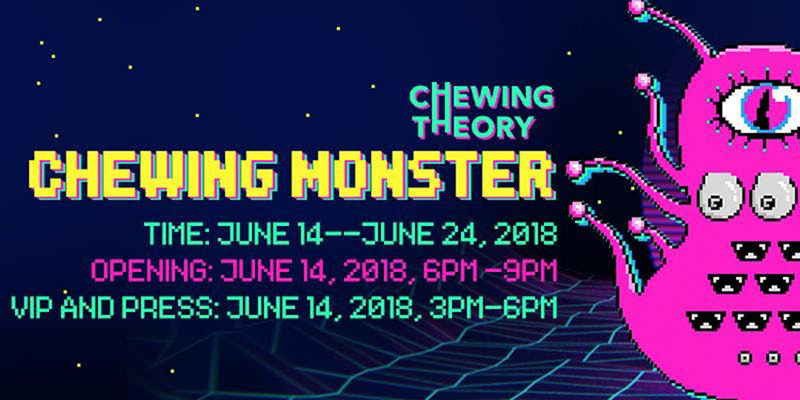 Chewing Monster will create a win-win situation by not only helping to maintain and enrich the common wellbeing of the human species but also giving a healthy boost to the agricultural economics of the Chewing Universe. We hereby cordially invite every one of our human friends to come on board and co-develop this forward-thinking venture; be our visitors, be our breeders, and be our family.